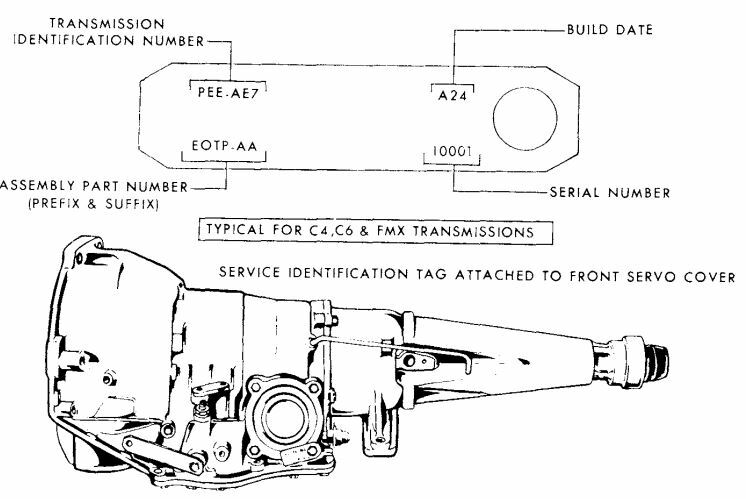 Automatic transmission applications, tag decoding, and part numbers for the 1980 - 1989 Ford trucks. Ford has used a number of different automatic transmissions in trucks from 1980-1986, partially due to the multiple engines used during those years. They ranged from a 232 ci V6 for two years, to the 460 ci V8 and diesels. The lighter duty gas engines could have a C5 (updated C4), C6 or AOD, the heavier duty gas engines and diesels got the C6 only. Identification; C4/C5, aluminum 3 piece unit, converter housing, main case and extension, rectangular pan, longer than it’s width; AOD, 2 piece aluminum unit, case and converter housing together then extension, pan long and tapers in at the rear, METRIC stamped on bottom; C6, also 2 piece aluminum, large servo cover on right side front, pan is squared and has an indent on the right rear where the modulator diaphragm mounts. Ford started in 1960 using manifold vacuum to a diaphragm on the transmission to provide the engine load to the valve body. The valve body is essentially a simple hydraulic computer which compares road speed to load in order to decide when to upshift. A governor on the output shaft provides a pressure proportional to the rpm of the shaft. The shift valves have a hysteresis built in by requiring substantially more pressure from the modulator (engine load) in order to shift down, this prevents “hunting” between gears. The C5 and C6 use this type control, the AOD reverted to a mechanical throttle valve to provide the engine load signal, but still uses the governor on the output shaft. The service vacuum modulator diaphragms are adjustable for shift point and quality, tighter is later firmer shifts and looser is earlier softer shifts. The C5 had a centrifugal lockup converter to improve highway fuel mileage, the AOD uses a direct mechanical connection on the input shaft for 3rd (direct) gear and roughly 80% of the power for 4th (OD) gear comes through that input. ​Adjustments, band adjustments, C4 and C6 bands have external adjustments, but only the 2nd gear band is used on the C6, low and reverse use a multiple disk clutch. The AOD band is only adjusted during overhaul and requires special tools to adjust it. External, on C4 and C6 there is a downshift rod or cable that moves the internal downshift valve to force a downshift, adjustment is at WOT and basically little play between the throttle lever and downshift lever. AOD is a whole different ball game, the throttle cable or linkage calls for a pressure gauge and setting gauge to get the pressure correct, too low and you will burn up the OD and maybe direct clutches, too high and the transmission will “hunt” between 3 and 4. If you are experiencing this, on a carbureted engine back the screw for the AOD throttle rod out about 1 turn and test drive, EFI, release the cable casing latch and move the cable casing 1 notch toward the throttle lever and test drive. On either if it is still late move it another turn or notch. If it is shifting early and slipping, go the other way. This is how we used to set up the old 4 speed Hydra-Matics, by shift feel.